On Christmas morning I awoke to a full day of Sickmas! Thank goodness my family was home and was super kind. All of the Christmas prezzies had been purchased and wrapped for the kids and no one seemed to mind cereal for breakfast and my sweet son went and picked up Chinese food for dinner while I sat like a blob on the sofa in my big fussy blue robe. Sick and all it was a very good day. 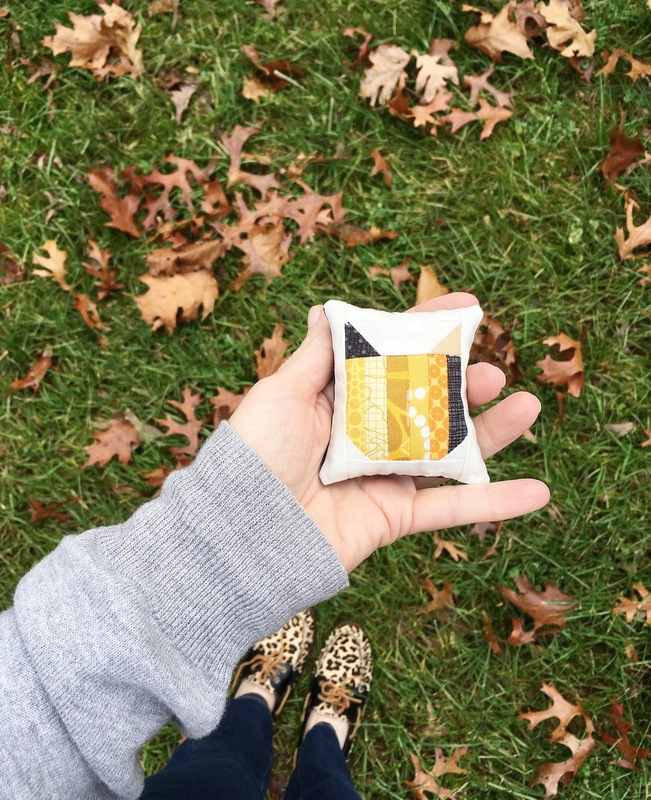 I made it back to my sewing machine on Tuesday and made a resized version of Elizabeth Hartman's cat pattern to a pincushion size! It is scrappy and absolutely ADORABLE! You can find the original pattern here. Let me know if there is a want for the resized pieces for the pincushion. It is fast and easy and really fun to make! 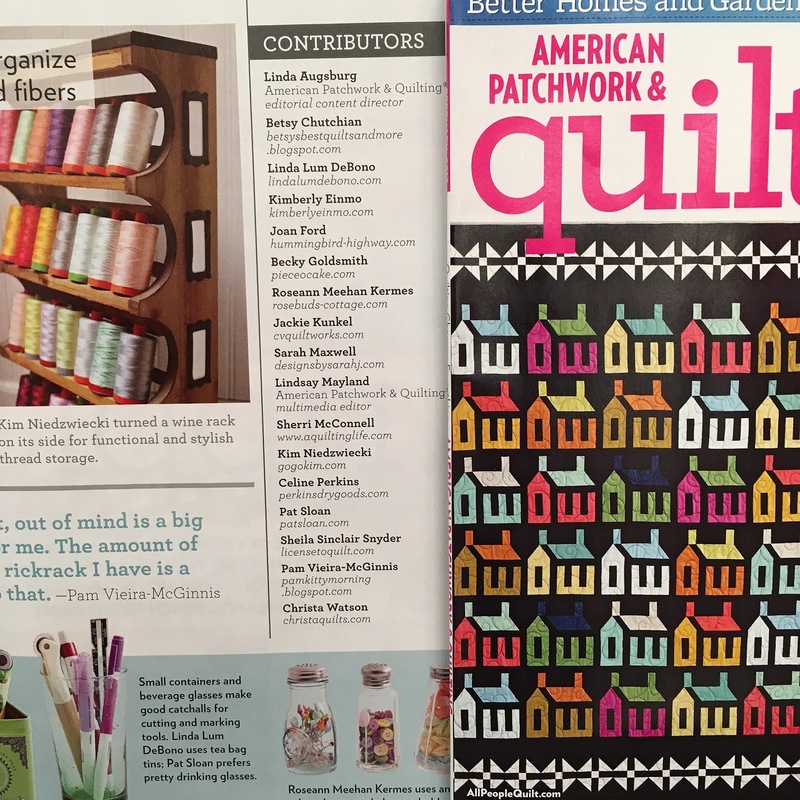 I also was TOTALLY excited to see MY NAME in the latest issue of American Patchwork and Quilting! 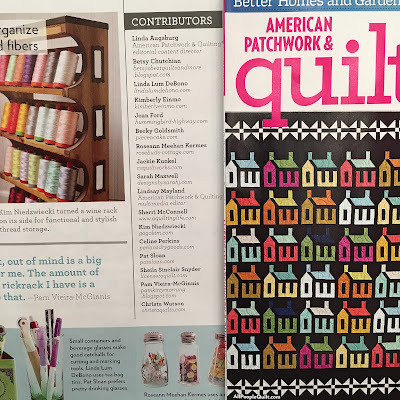 Go out and get your copy now because it has Wendy Sheppard from Ivory Spring ( I love her and she is brilliant) on the cover and in this issue is also full of tips for real life sewing organization! I know I need more help! The biggest joy was that my name was spelled correctly, LOL! Today was in my sewing room and back to work on getting things back to some normal. Normal may not be the correct word. Getting back to Go-Go! That is really more accurate. I am not really a great sitter and non doer. 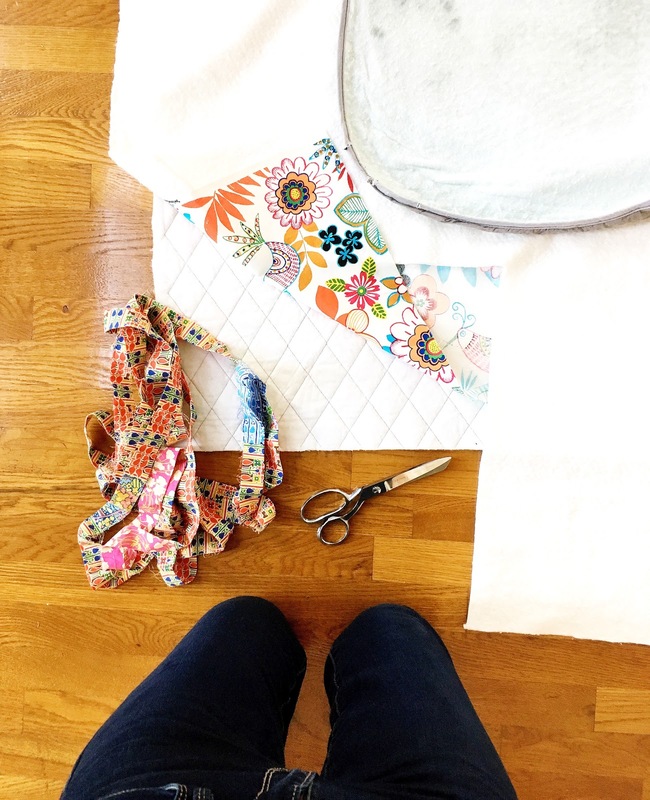 I was not really ready for quilt blocks but did feel like sewing ( YAY getting better). 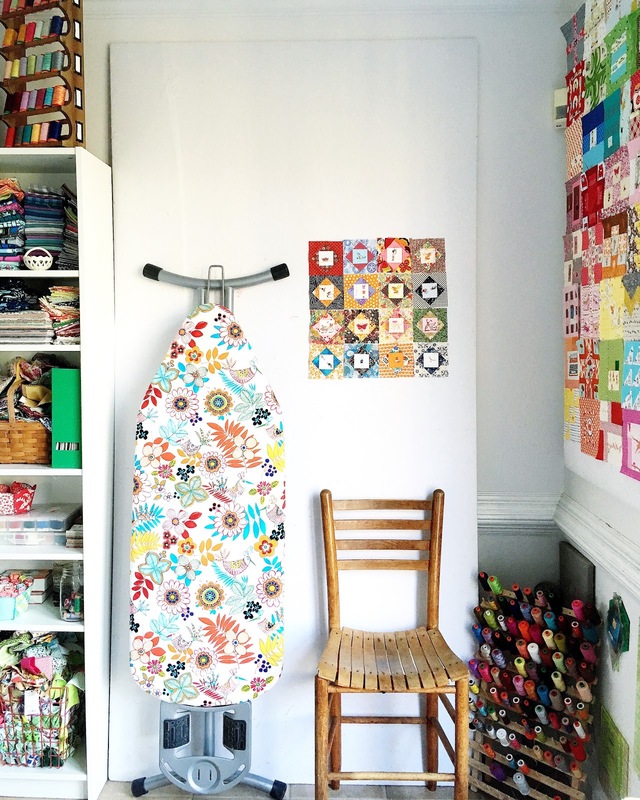 I decided to recover my ironing board! With my old ironing board cover as a guide, I grabbed my favorite Alexander Henry fabric, new ironing board fabric ( Joann's has a 50% online coupon right now) and batting and starting cutting! I also had some biased cut Liberty Lifestyle binding for the cord to go through! I used Aurifil 40wt thread to stitch it up. The 40wt is heavier and more durable for items that get higher use. It only took a couple of hours to have a wonderful new cover that makes me SO HAPPY! The colors just make me smile! It is the little things in life that really mean so much! Color, organization and being able to GO-GO! I love you ironing board cover. Maybe I will try to make me one. I need a new one - mine has a hole in it. I love that ironing board cover! It makes me smile. AND it makes me want to recover my big one. I usually just use my table top board, but when I have a lot of yardage to press I pull out my dingy old regular board. And it REALLY needs a new cover. I need to make a new cover sometime soon-ish. 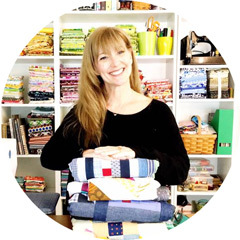 Do you just use regular cotton batting, or do you use some sort of fancy-schmancy batting for it? Cute, cute ironing board cover. AND cat pincushion. I would lover to have a tutorial about enlarging (or shrinking!) Patterns. I tried to enlarge her (EH) fox for a big throw pillow. I ended up with a funky distorted pile of mismatched pieces. Glad you're better! Cute, cute ironing board cover. AND cat pincushion. I would love to have a tutorial about enlarging (or shrinking!) Patterns. I tried to enlarge her (EH) fox for a big throw pillow. I ended up with a funky distorted pile of mismatched pieces. Glad you're better! Sorry that you were sick on Christmas but it still sounds like you had a nice day. Sometimes I think once in a while a quiet Christmas Day would be nice. I love the kitten pin cushion and would really appreciate the measurements for the small size. Oh how pretty - that will make you smile when you do some pressing! What?! It's a piece of art!!! That would make me smile and want to use it!! Such lovely fabric you chose to cover your ironing board with! I have wanted to recover my ironing board for over a year and just keep putting it off. I need to add this TO DO PROJECT on my list for 2017! Thank you for sharing and inspiring! Have a fantastic creative day!